Peter, a former President of the Society opens the door to the future of the Society. Photograph taken by Jack Gittins of W.J. 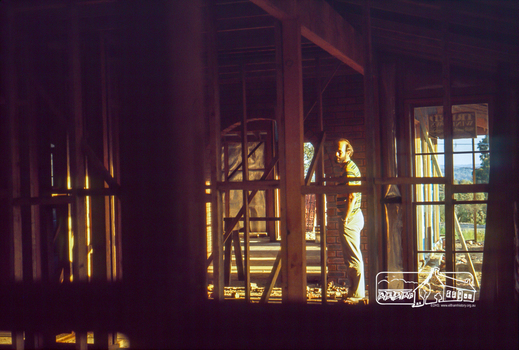 Gittins & Associates who were consulting on the property's trees. 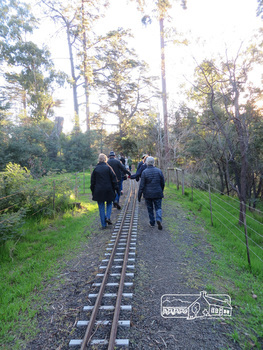 Newsletter No., 229, August 2016 Heritage Excursion - Maroondah Aqueduct Walk - Saturday 3rd September The Maroondah Aqueduct was once a major link in Melbourne’s water supply system. 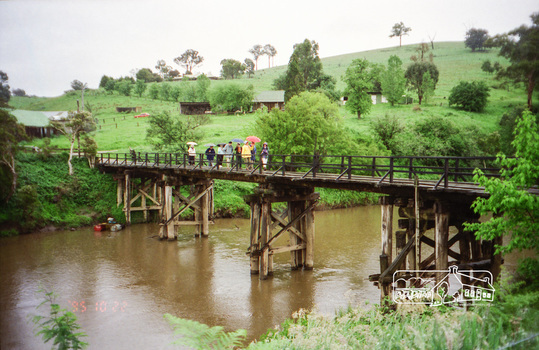 It was built between 1886 and 1891 to transfer water from the Watts River near Healesville to the Preston Reservoir. It was 66 km in length, made up of 41 km of open channel, 10 km of tunnel through hills and 15 km of pipeline across stream valleys known as inverted siphons. The section of the aqueduct through the Eltham area has been abandoned since the 1980s but the open channel has largely been retained. A recreational path follows the aqueduct reserve. For our excursion on 3rd September we intend to walk along the section of the aqueduct adjacent to Allendale Road. This is a section not visited on previous excursions and includes the transition from open channel to the inverted siphon across the Diamond Creek valley. Apart from the aqueduct itself the main feature of the walk is the extensive views across Eltham North and Diamond Creek. Along the way we will talk about the history of the aqueduct and the area. This easy walk is about 3 km return and will take 2 to 2.5 hours. It will start at 2pm at the junction of Allendale Road with Godber Road and Zig Zag Road North, officially Diamond Creek, but on the northern boundary of Eltham. (Melway ref.12 B10). 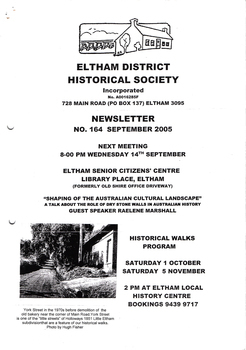 Newsletter No., 234, June 2017 Heritage Excursion - Saturday 1st July - Eltham Lower Park - Walk and Talk Eltham Lower Park has played an important part in the history of our area since the early days of European settlement when it was used by local residents as an informal racecourse. 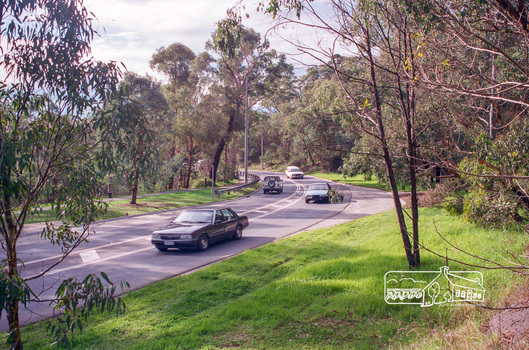 Prior to that its location at the junction of the Diamond Creek and the Yarra River made it an important meeting place for the Wurundjeri people. The park combines formal elements and sporting facilities with remnant bushland that is of environmental significance. 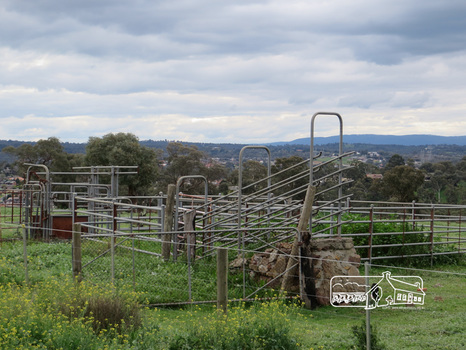 It is home to sporting and horse riding clubs, popular play spaces and the Diamond Valley Miniature Railway, which attracts large numbers of visitors. The park will be the venue for our July excursion which will comprise a walk of about 3.5 km around the park and adjacent areas. Along the way we will discuss the history and natural history of the area. The path along the creek and the river provides a pleasant and scenic walk. This walk on Saturday 1st July is about 3.5 km in length and will take 2 to 2.5 hours. It will start at 2pm at the Main Road car park at the front of the park. (Melway ref 21 H 10). Scrapbook album approx 40 x 30 x 4 cm, black hardcovers and 36 double page openings, numerous blank pages. Put together by a member of the Eltham Community Action Group in participation with various artists, writers, local business people and other local citizens and sent to Minister Maclellan, Planning Minister in the Kennet Government in protest of proposed plans to sell the former Eltham Shire Office site at 895 Main Road Eltham in order to develop a Shell Service Station and Hungry Jacks fast food outlet. 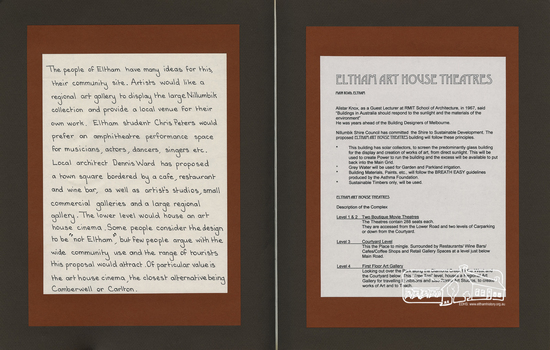 The purpose was to express what is unique about the character of Eltham, why people live and work there and why such a development would be out of character and inappropriate for the Eltham Gateway along with alternative development proposals. 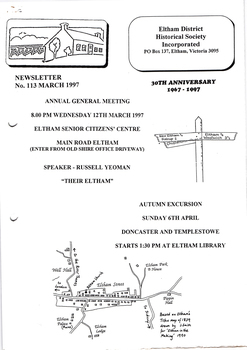 This protest was the catalyst for the formation of the Eltham Community Action Group. 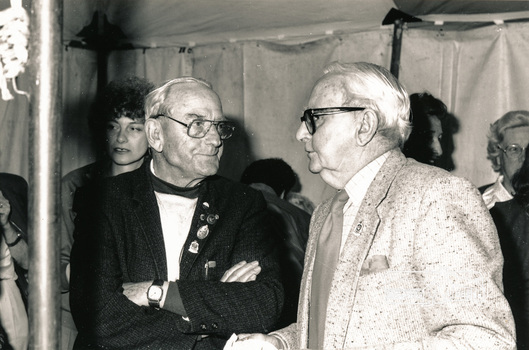 Used in Shire of Eltham display at the Eltham Community Festival, 7 November 1987. 14 Stokes Place was the home of Peter and Carla Vermey. 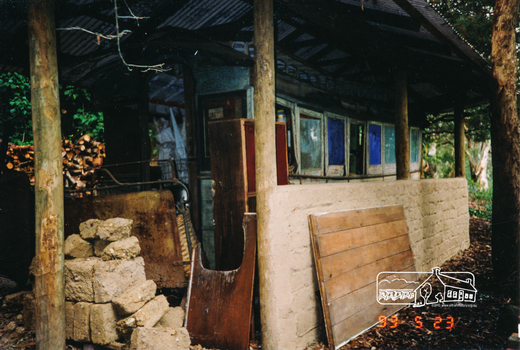 The land was purchased in May 1979 and the home built by Peter and Carla Vermey after the developer, Macquarie Builders went bankrupt. Sold October 2017 by Morrison and Kleeman Real Estate. 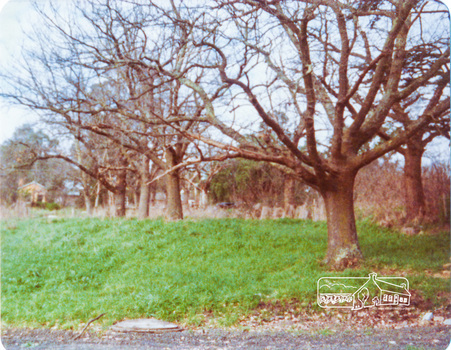 Stokes Place was part of the Stokes Orchard Estate which was developed from the break-up of the the orchard owned by Frank Stokes who lived on the northeast corner of Nyora Road and Eucalyptus Road. His daughter Beryl advised that the Shire had levied a rate assessment on individual parcels of land within the orchard which became unaffordable resulting in its sub-division and sell off. 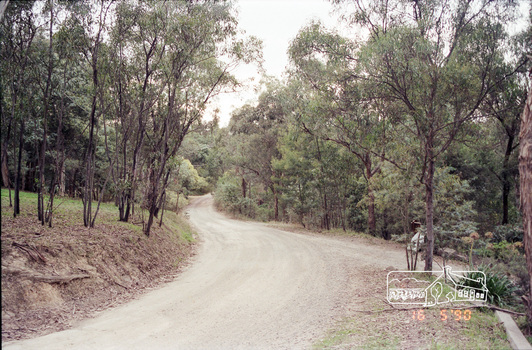 The Stokes Orchard Estate was developed by Macquarie Builders in two stages starting with stage 1 in 1976. 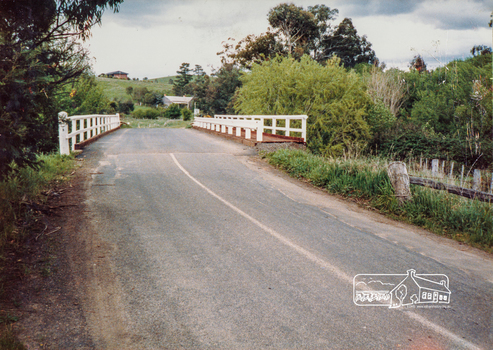 Stokes Place was part of Stage 2 in 1979. 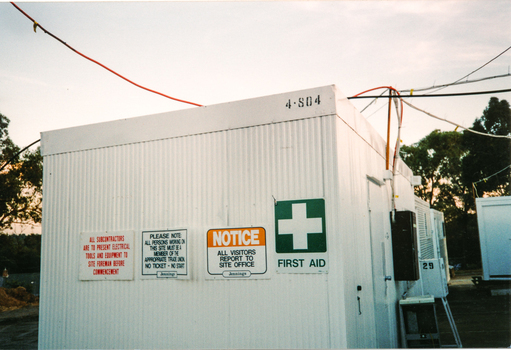 The Estate was bounded between Nyora Road, Eucalyptus Road, Diosma Road and Stokes Place. The original orchard only just reached the left most portions of Stokes Place and did not go fully up to Diosma, rather to just beyond the extant of Stokes Place. Stokes Place was known within the family as "The Oats" as that is where they grew oats. Frank Stokes moved to Eltham c.1945 after visiting Harold Bird to view his orchard, located diagonally opposite Stokes Orchard from the intersection of Eucalyptus Road, Pitt Street and Nyora Road. It was on Harold Bird's recommendation that Frank purchased the land. The Stokes Orchard Estate collection is typical of housing developments of the late 1970s and 1980s. 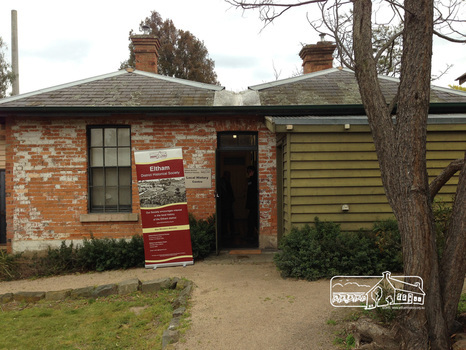 It was one of the earliest estates in Eltham following the nearby Woodridge Estate development. 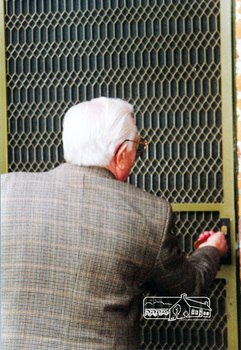 Soft cover, 32 pages, photographs, 32 cm. 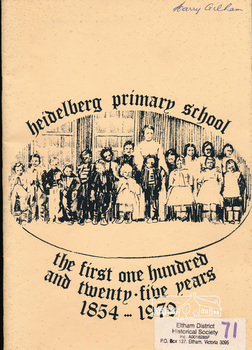 A history of Heidelberg Primary School no. 294. Includes photographs. A link was established with the Austin Hospital in 1908. Top Row, from left - Tom Lovass, Mark Holding, Margaret Jarvie, Graham Ford, Carolyn Edmonds, David Petersen, Phil McKenzie, Liz Edmondson, Craig Westhead, Ray King, Lodi Francesconi. Middle Row, from left - Kevin Garvey, Jeanette Cornish, Peter Spiller, Linda Kirkwright, Earl Roberts, Tony Guzzo, Rodney Roscholler, John McDonough, John Higgins, Keston Clarke, Jeanette Sproat. Front Row, from left - Mark Sutcliffe, Natalie Sannholm, Des Powell, Lee Hayes, Neanne Roker, Lynda McNally, Liz Blake, Jane Glynn, Marg Shepherd. (Staff not present – Carole Bell, Charmayne Rose, Margaret Marczuk, George Overton, Ian Young, Joe Galea, Stacey Hesketh, Marjorie McNeil). 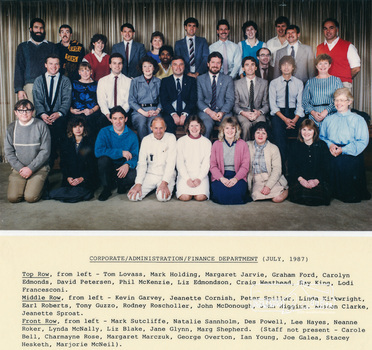 Originally contained in an envelope with handwritten note on enveloe to Allan Baker dated 14 Dec 1987 "Enclosed for your use are staff photos of all departments. I've given each Champion of Committees copies for all their respective Councillor photos of Depts reporting to each committee. Outdoor staff photos will be taken next week and I'll make those available as soon as possible. 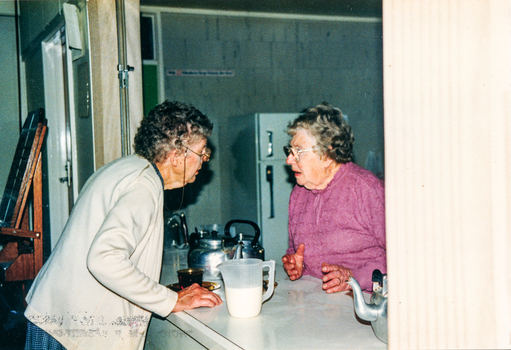 Cheers (Undecipherable)"
14 Stokes Place (Lot 83) was the home of Peter and Carla Vermey. 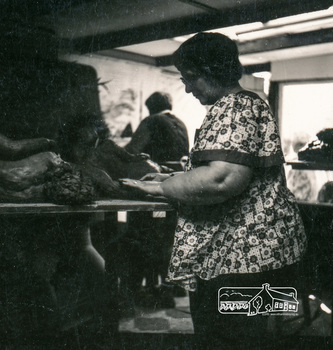 The land was purchased in May 1979 and construction commenced September 1979. 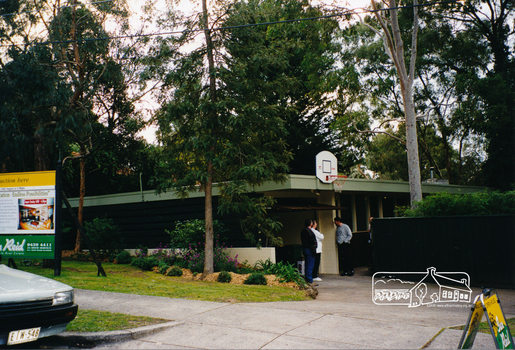 The home was built by Peter and Carla Vermey after the developer, Macquarie Builders went bankrupt. Sold October 2017 by Morrison and Kleeman Real Estate. 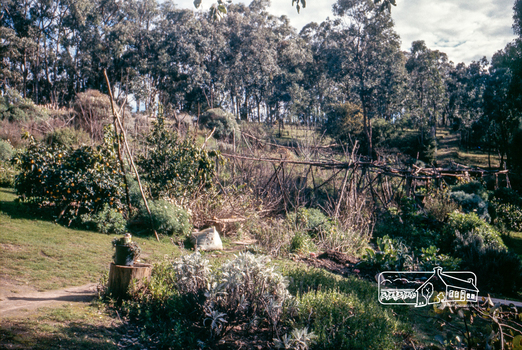 Stokes Place was part of the Stokes Orchard Estate which was developed from the break-up of the the orchard owned by Frank Stokes who lived on the northeast corner of Nyora Road and Eucalyptus Road. His daughter Beryl advised that the Shire had levied a rate assessment on individual parcels of land within the orchard which became unaffordable resulting in its sub-division and sell off. 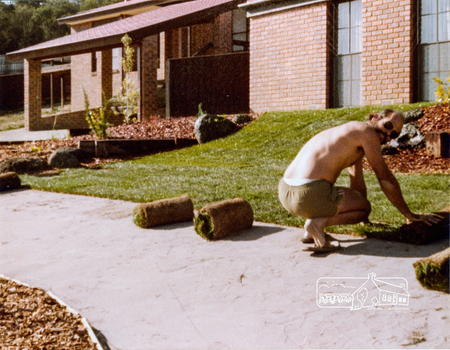 The Stokes Orchard Estate was developed by Macquarie Builders in two stages starting with stage 1 in 1976. Stokes Place was part of Stage 2 in 1979. 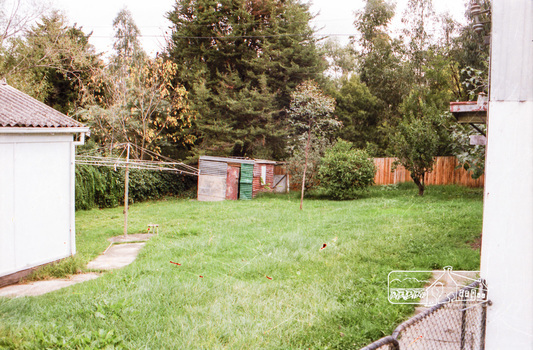 The Estate was bounded between Nyora Road, Eucalyptus Road, Diosma Road and Stokes Place. The original orchard only just reached the left most portions of Stokes Place and did not go fully up to Diosma, rather to just beyond the extant of Stokes Place. 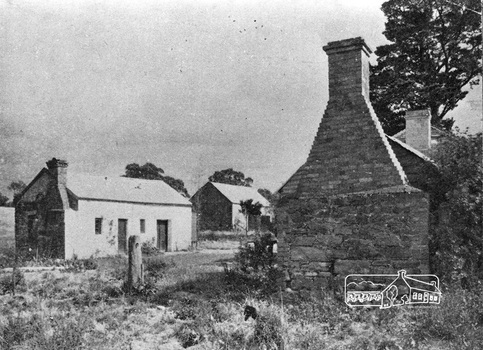 Stokes Place was known within the family as "The Oats" as that is where they grew oats. 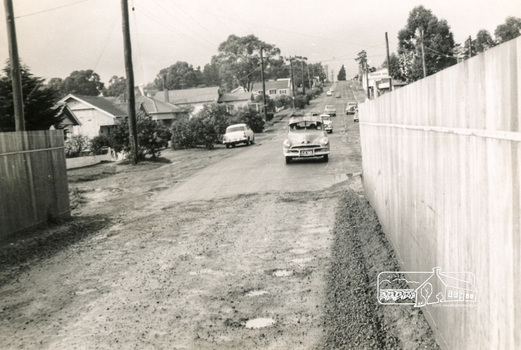 Frank Stokes moved to Eltham c.1945 after visiting Harold Bird to view his orchard, located diagonally opposite Stokes Orchard from the intersection of Eucalyptus Road, Pitt Street and Nyora Road. It was on Harold Bird's recommendation that Frank purchased the land. [from EDHS Newsletter No. 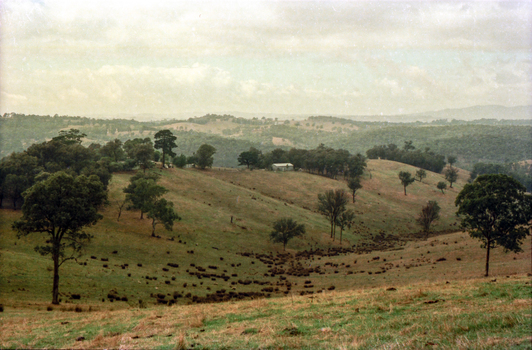 86, September 1992:] SPRING EXCURSION MARYBOROUGH: As a Spring excursion our bus trip on 27th September is well timed - Maryborough is conducting its Wattle Festival on that weekend. We are to be guests of the Midlands Historical Society who will provide a guide for our tour of the town. This is a somewhat longer trip than we usually undertake so we have an earlier start at 8.00 am and the cost is a little more than usual at $20.00. The entry to the Midlands Society's Worsley Cottage is included. At the end of the town tour we will visit the C.W.A. 's Fair which is part of the Wattle Festival. Afternoon tea will be available there for a small charge. Bring your lunch and something for morning tea if you wish. We will be travelling to Maryborough via Creswick and Clunes and returning via Castlemaine. We will return about 6.00 pm and transport home can be arranged if required. 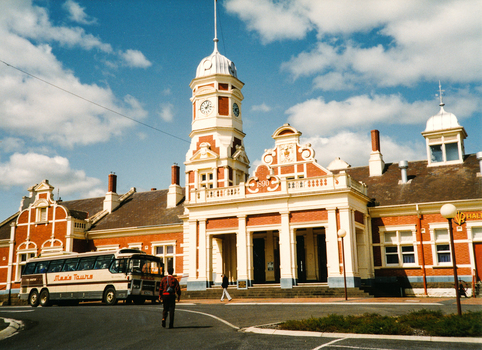 Maryborough has a rich history with the gold era being particularly significant. 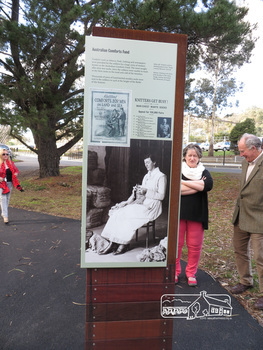 Local historian Betty Osborne has produced the book "Maryborough - a Social History 1854-1905". You might like to try and obtain it from the library for advance reading or it will be available for purchase on the day at $25.00. To book for this tour please complete the attached from and return with your payment to the September meeting or send it to our post office box. Friends are most welcome as usual.